Canned pumpkin basks in the limelight as my favorite cooking ingredient of the season. At around only $2 a can, its available in organic and no-salt-added varieties. Usually, fresh foods have a higher nutrient content than their canned counterparts, but you can refrain from pumpkin pulp scooping here: canned pumpkin retains its impressive chock-full nutrients of potassium, vitamin A, and iron. Versatile too, just one can has the ability to turn out savory soups, spiced muffins, sweet breads, and your classic pumpkin pie. 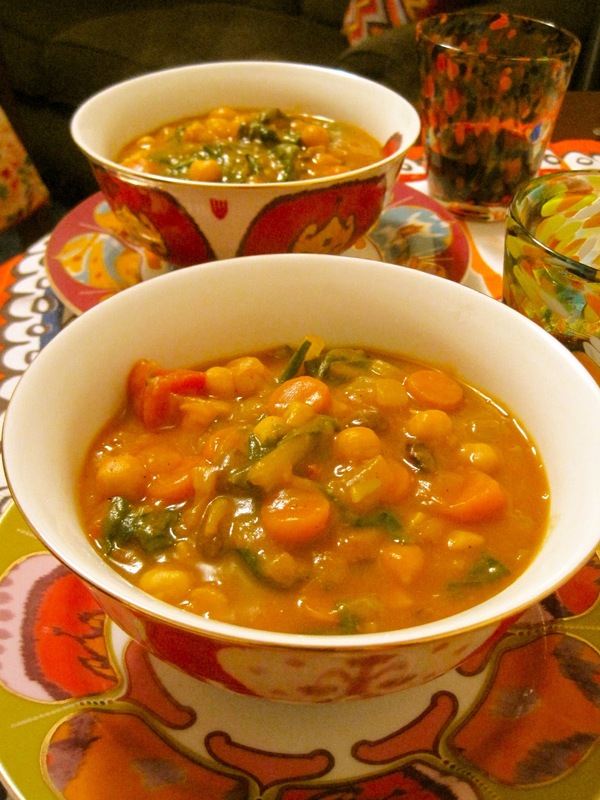 I found this Moroccan Pumpkin Stew recipe via Meatless Mondays. Inspired by Presidents Wilson, Truman and Roosevelt's call for America to voluntarily cut down on meat consumption during both World Wars, the current non-profit initiative aims to reduce our meat consumption by 15% in order to improve both personal health and the health of the planet. By participating in Meatless Mondays, you can reduce your carbon footprint- the meat industry generates about 1/5 of man-made, climate change-accelerating greenhouse gas emissions- minimize water usage- an estimated 1800 to 2500 gallons of water go into a single pound of beef-and help reduce fossil fuel dependence- 40 calories of fossil fuel energy goes into every calorie of feed lot beef, versus 2.2 calories of plant-based protein. Furthermore, Meatless Mondays are beneficial to your personal health: reduced risks for cancer, heart disease, diabetes, and obesity are all associated with a low-meat diet. Check out their website for a plethora of meatless breakfast, lunch, dinner, dessert and snack ideas, and Join the Movement! 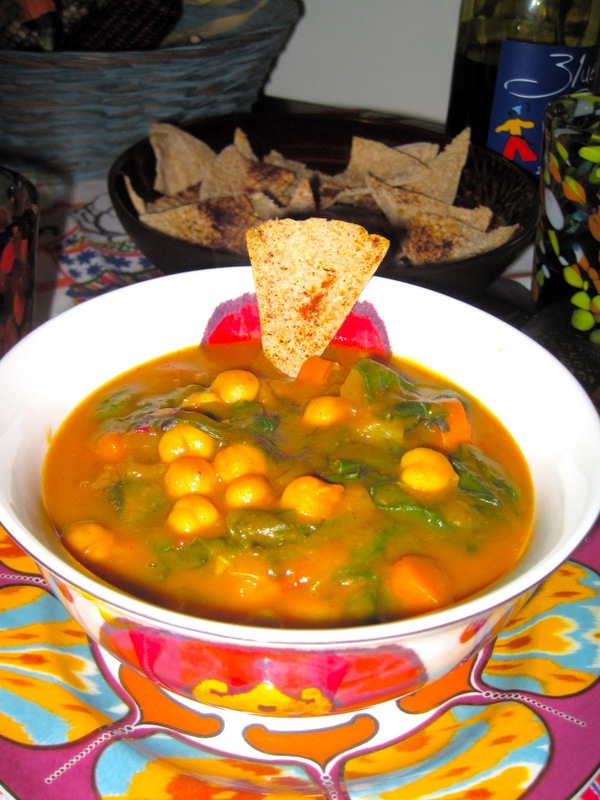 I served my stew with pita chips- they added a nice crunch and were a great accessory to scooping up the chunky soup. (Check out my Fava Bean Dip with Homemade Pita chips post for the recipe.) Meatless Mondays suggested serving the stew over couscous with slivered almonds and apricots. 1. Heat oil in a large heavy saucepan over medium head. Add onions and carrots (and potato if using), and saute for 5-10 minutes, stirring occasionally. 2. Stir in ginger, garlic, and spices. Saute for another 5 minutes. 3. Add canned tomato, vegetable broth, and greens. Cook covered for 5 minutes, until greens decrease in volume. Add canned pumpkin, water, raisins, and chickpeas. Bring soup to a boil, and simmer for another 5-8 minutes. 4. Stir in salt and pepper to taste, and a few drops of red wine vinegar before serving. 5. Garnish with yogurt or pumpkin seeds if desired. "Why Meatless?" Meatless Mondays. Johns Hopkins’ Bloomberg School of Public Health. Web. 4 Oct. 2011. <http://www.meatlessmonday.com/why-meatless/>. Zeratsky, R.D. L.D., Katherine. "Canned Pumpkin: Better than Fresh?" Nutrition and Healthy Eating. The Mayo Clinic, 17 Oct. 2009. Web. 4 Oct. 2011. <http://www.mayoclinic.com/health/pumpkin/AN01754>.